BEST has announced that it will issue bus passes to Visually Impaired and Physically Impaired passengers with more than 40% motor disability or handicap. According to a Press Note dated 19th October 2016, the scheme would be operational from 20-10-16. Mumbai – Effective from Thursday, 20/10/2016, a program is being activated for handicapped persons (visually impaired and >40% handicapped) to avail of free transport in buses (except air-conditioned buses) operated by the BEST Undertaking. The free travel benefit can be availed of by blind (visually impaired) and handicapped (more than 40% physical handicap) persons. This program will be applicable in the Mumbai Metropolitan region and adjoining cities where the BEST Undertaking bus service is operational. For those availing of the benefit, it will be mandatory to possess a RFID smart card/ ID Card issued by the BEST Undertaking. 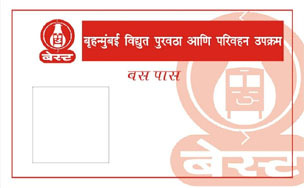 The blind (visually impaired) and handicapped (more than 40% physical handicap) persons wishing to avail of the benefit are required to go to Transport Departmental Office in any depot of the BEST Undertaking near their residence (or any other depot otherwise convenient to them), collect the free printed form issued by the undertaking and submit it, filled up along with a photocopy of the handicap certificate to the concerned Administrative Officer or Depot Officer during the office timings (9:00 AM to 4:30 PM, except for Sundays and public holidays). After the Administrative Officer scrutinises the form and the attached documents, the applicants will be sent to a nearby bus pass distribution centre for registration and photographing. The applicants will have to pay a fee of 40 rupees (only in the beginning) for the RFID card / ID card. The bus pass will and RFID card will be made available within 4 to 7 working days of registration at the bus pass distribution centre. Once this program for free transport for blind (visually impaired) and handicapped (more than 40% physical handicap) persons is activated, the existing travel fare benefit programs for visually impaired and handicapped persons will be cancelled. All blind (visually impaired) and handicapped (more than 40% physical handicap) persons are requested to avail maximum benefit of this program of free transport in the in buses (except air-conditioned buses) operated by BEST Undertaking. Prior to this BEST used to charge a flat fare of ₹2 for totally blind passengers on non-AC buses, irrespective of the distance traveled. This used to be ₹1 earlier. Accessibility in the Commuting and Transport sector is virtually negligible in India. This is a good step towards changing that. While one may argue that Subsidies are not good, this shouldn’t be treated as a subsidy but rather a necessity. Thanks to Rohini and Sameer for help with translations. Thanks to Zophop for notifying users. BEST has an update for their long lost initiative of informing commuters when a bus will arrive, to attract more commuters to use buses. BEST will now show real-time locations of AC buses using a third party android application called Zophop. It is interesting that BEST is partnering with third party private firms to inform the commuters than maintaining the tech in house which can result in heavy IT expenditure. Even though we have our very own GPS satellites in space, tracking a bus still seems like a challenge. Intelligent Transportation Systems (ITS) is the new hot discussion among many cash deprived transit agencies, every agency wants to use them to improve operations and attract commuters. BMTC has recently launched their own ITS system with a whopping cost of 89 crores to track buses. But none of these systems can help the agency if they are not implemented in the right way. Every agency is experimenting with the setup with no major success stories in sight. In the past BEST has sold the rights of advertising to a third party firm Verve Soft Pvt Ltd. which has placed GPS units, TVs in the buses. This firm has launched a website and app called BEST Passenger Information System (http://bestpis.in/) with little or no useful information. This lack of useful information resulted in many third party applications to track locals and bus timings in Mumbai like m-indicator, smartshehar, ridlr, Zophop and citizen led initiatives like ChaloBEST. BEST partnering with one such firm is an interesting development, yet is it only sharing the data with zophop or will it also share it with others? Several people have approached BEST for data and have been shunned away in the past. From an anecdote, IIT Bombay was paying a hefty amount to buy GPS data of BEST for their research work on a real-time multimodal trip planner. As a public agency BEST cannot favour one private player and the partnership terms need to be transparent, so that any other private firm like Google Maps can also access this real-time data to show updates for commuters. For BEST to share this real-time data with others, it should be noted that the data rights need to be with BEST. From what is known BEST has already sold these rights to Verve Soft Pvt Ltd. and may not have any rights over it as BEST has not spent any money on GPS units and might be receiving money through advertising revenues. Several transit agencies abroad have been sharing their real-time data to commuters by making it open to anyone including researchers and individual developers. Even though BMTC has announced an intention for such an open data policy to share data with third parties, it hasn’t been executed yet. Third party partnerships and open data policies will likely be adopted by many transport agencies in the near future in India. BEST is already experimenting with such practices, but it needs to be more transparent in doing so as a public agency. Disclosure: The author was an employee/Director at Zophop briefly in 2014 and helped source transport data while at the firm. In the past, I had explained why bus journeys are fun. But there is, one thing more fun than a bus ride. A ride in a Double Decker. While many cities including Bangalore, Hyderabad and Delhi had double deckers earlier, only a handful of them continue to operate them, namely Mumbai, Kolkata, Kochi and Solapur. A BEST Double Decker on Route 138 at CST. Image copyright Srikar Kashyap, CC-BY-SA 3.0 Unported. Now, Double Deckers have been in Mumbai since the 1930s. In the last few years, there were talks of BEST scrapping them, but they decided not too, saying that they were an irreplaceable part of the city’s heritage. Among the reasons for scrapping them were: Extra cost in maintenance, difficulty in maneuvering, and the fact that they required two conductors, one at each level. But, but but, they were not scrapped, and we are thankful that have not been because they are really really fun to travel in. BEST earlier used to ply them on 251 of the Oshiwara Depot from Versova to Andheri Station [West], but after the merger of the Versova and Yari Road Bus Stations into one, as well as the commencement of the Metro, they were replaced with regular buses, mainly due to the reduction in passenger traffic as well as height clearances on the West. They still run on the East, connecting Agarkar Chowk to SEEPZ due to height clearance from the Metro. Most of Mumbai’s flyovers are built at a height to allow double deckers to pass beneath them. Among the prominent routes they run on, as 310 from Bandra Station [East] to Kurla Station [West], and 138 from Backbay Depot to Chhatrapati Shivaji Terminus. 138 enjoys a reputation because it not only plies within the CBD, but also because it plies along Marine Drive. Double Deckers are fun because there is no driver in the upper level. As a kid, I was known to run up and sit up front to enjoy the breeze hitting my face. I was also branded the black sheep of my family because I once sent my cousin crying down after I told him the upper level had no conductor and only grown-up children were allowed. I do not regret doing that. During every trip of mine, I used to run up to the top, just for the air to hit my face. On one of my trips, a friend of mine from Gurgaon, who had never been in a Double Decker got in with me. He was awestruck, and spent the the entire journey with his DSLR stuck to the front window, capturing footage of vehicles moving at at 8pm at Bandra Kurla Complex. We have been known for playing games, with the conductor being complicit in our [mis]adventures. We used to pretend that the upper level of the bus was a vehicle with a mind of its own, and that we, along with the conductor had to stop it from running into an obstacles. Double Deckers have become an inalienable part of our culture. It is unfortunate that several cities like Chennai and Bangalore cannot ply them because of height restrictions. Truly, these buses are a gem! I am taking my Alexa rank to the next level with Blogchatter. Current rank: 461983 globally and 26696 in India. I was going thru the BEST website today, and was going thru the Daily Press Notes section, when I came across an interesting press note, dating to 21st February 2015. A very interesting note to say the least. The Press Note, Numbered 65, on 21/02/15, is an appeal to Consumers of the Electric Department. It talks of a rumour that has been spreading via Social Media to ask Consumers to check the back of the BEST Electricity Bill, where there is an alleged claim that BEST’s electricity department is charging consumers for losses made by the Transportation Department, and that if you wrote a letter and handed it over at the Head Office at Dadar TT, they would stop charging you. BEST responded by saying that such rumours were baseless and consumers should not pay any attention to them. Fair enough right? But, did anyone notice a deeper message? For starters, this message came at about the same time when BEST made its first mistake. The disastrous fare hike of February 2015. This was followed by an even more disastrous fare hike in April 2015 that left BEST [especially its lacklustre AC services] completely alienated from its passengers. It was during the latter half of 2015, that BEST AC conductors at Thane Station encouraged passengers to take a TMT AC 65 or NMMT AC 131 instead of the AS 700. Even BEST conductors seem to have dissociated themselves from their own buses! Next, as stated earlier, BESTs Transport Deficit is -₹858.02crore while the Electricity Surplus of ₹925.41crore. This ₹67.39 that is left over, along with some cash from the MCGM, as well other schemes such as JnNURM/AMRUT and from the State Government is what keeps BEST afloat. In the long run, it is true, that the Electricity Division surplus does pay for the deficit, but in a different manner. As per BESTs tariff, there is a Transport Deficit Loss Recovery Charge which is charged as a rate per kilowatt. Doesn’t this actually prove BEST’s notice false? Or was the notice only about getting the surcharge reversed on submitting a letter? Confusing, isn’t it. But.. But.. But.. There’s something interesting to note here. BEST supplies electricity only to South Bombay. The Suburbs are served by Reliance Energy [formerly BSES], and MahaVitaran [MahaDiscom]. South Bombay is home to Mumbai’s richest people. Actually the country’s richest people. So, let us take a look at the tariff structure of BEST, Reliance and Mahavitaran side-by-side, shall we. I’ll be comparing the regular rates for residences under the non BPL category. Fixed charge goes from ₹40 to 100, the consumption charges vary from ₹2.45 to ₹6.35 per Unit and only goes up to 8 when the consumption is above 500 units, that too for the balance units over and above 500 units. Fixed charge goes from ₹50 to ₹100, the consumption charges vary from ₹2.43 to ₹5.57 per Unit and only goes up to 7.21 when the consumption is above 500 units, that too for the balance units over and above 500 units. The format used by BEST and REL is not present and hence requires a little thinking and calculation. While BEST might be charging more per kW/hr or Unit, it charges a minimal Transport Loss Surcharge which does not exceed ₹1.44 per Unit [Below 500 Units]. REL instead charges a fixed wheeling charge of ₹1.8 per Unit and a Regulatory Asset Charge, which ranges from ₹0.56 to 0.89 per Unit [Below 500 Units]. This brings the sum total of Reliance Energy’s charges to higher than BEST. Plus, with all the rich bigwigs and the who’s who of the social circuit living in BEST’s captive territory, does it really matter? BEST, in 2015 recognised the existence of Social Media. Yes. They acknowledged that something called Social Media exists. Small, as it may seem, this is a significant step in getting our Government bodies on Social Media to respond to citizens better, as I had stated in an earlier post. P.S: The head office of the Electricity Department is located at Electric House and the Transport Department at Transport House, both of which are part of the Colaba Depot, which was BEST’s first depot. I am taking my Alexa rank to the next level with Blogchatter. Current rank: 492454 globally and 28827 in India. Travel: Something we do on a daily basis. Also known as commute when done in the same city/region to head to work. However, travelling alone, no matter where has a totally different ring to it. I travel alone a lot. Be it long distance, or short distance. It can be in any form, auto, taxi, bus, or train. Planes can also be counted, but I’ve rarely had any fun on a plane, just earaches and snobby co-passengers. I end up sleeping while listening to music during the flight. So now, coming back to our grounded transport. Here’s what I have discovered. Traveling solo opens up your mind to new thoughts that otherwise wouldn’t penetrate you. If you’re traveling with a friend chances are that you will spend most of your travel time interacting with them. When you go solo, your mind is open to observing more around and learning more. Whenever I’ve been in a long bus ride, be it something as short of Mumbai-Pune or something as long as Bangalore-Mumbai, I’ve always had interesting conversations. I’ve had discussions ranging from 3 Idiots to Nuclear Warfare. One one bus journey, I spent 5 hours discussing the state of India’s road network with my co-passenger. He was extremely enthusiastic on discussing the road network with me. We later branched into the rail network and ultimately discussed luxury buses. On another trip, I was discussing career plans with a Software Industry. Being a Computer Science student, I wasn’t too keen on taking it up as an occupation, and I was not interested in doing an MBA. He convinced me to write the entrance exams, which I did, and got into one of India’s better known B-Schools, but didn’t take up ultimately. My favourite trip was in 2009, when I discussed the Indian Education System, Piracy, Bad Roads, Missal Pav, Batata Vada, and Free Markets with a man who was an engineer in Bosch. How cool is that? On trains, I recall various conversations with people too. On a railway trip from Mumbai to Delhi in the Rajdhani, I had an intense debate with an elderly Tambram couple from Matunga on the pros and cons of Dairy Whitener that was given with the Tea and Coffee on the train. Yes, a 2 hour conversation purely devoted to Milk Powder. On the return journey, I was both given and giving relationship advice from a complete stranger. It might have seen awkward, but I have multiple times in the past been accorded the status of the Single Guy who gives the best Relationship Advice. Of course, knowing me, I an probably give you the BEST advice, even on an NMMT or TMT bus. On one trip in a Mumbai local, I was gifted a copy of the Bhagvad Gita. A month later, I was gifted a copy of the Bible by someone in the Delhi Metro. I’ve read both and keep them in my library of books. Travelling solo has made me understand more, learn more, and have interesting conversations with people from all walks of life. I think you guys should give it a shot too. I am taking my Alexa rank to the next level with Blogchatter. Current rank: 564838 globally and 44363 in India.